In 2012, we broke our glass ceiling yet again. 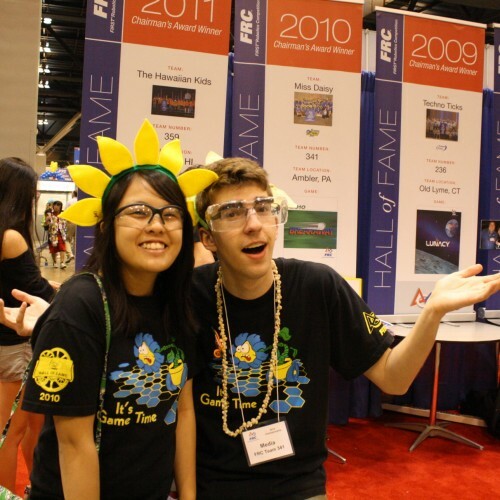 Miss Daisy set new personal bests and new world records for number of first seeds, number of wins overall, and highest scoring game in the official season. We competed hard and won two MAR district competitions, the MAR championships, and the Boston Regional. We finished the season as a Curie finalist. Our spirits were high going into 2012, and we hope to continue achieving great milestones! We ended the year with a record of 87 wins, 12 losses, and 1 tie. Very low center of gravity; Robot must tip >70 degrees before it doesn’t return to its wheels! In Rebound Rumble℠, robots have the goal of shooting basketballs into basketball-like hoops of three different heights and also balancing on a bridge with one to two other robots. During the first 15 seconds of the match, also known as the Hybrid Period, teams have the choice of using purely code-based movement or using the XBOX 360 Kinect during autonomous. Teams cannot cross the line, but they are able to retrieve balls from their alliance’s and the center bridge. The next 2 minutes are part of the teleop period. 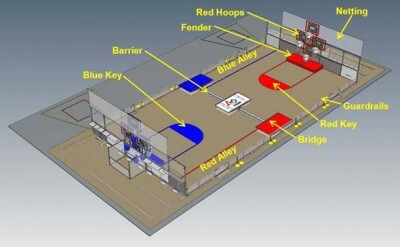 During this time, drivers gain control of their robots and score as many basketballs as possible. The top hoop is worth 3 points; the middle, two points; and the bottom, one. Robots can shoot from anywhere on the field. 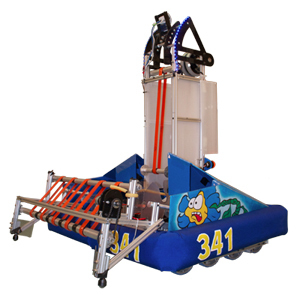 At the end of the match, in the qualifying rounds, robots can balance on any of the 3 bridges located in the center of the field. The middle bridge is worth two Co-opertition points while each alliance’s bridge is worth varying points based on the amount of robots on the bridge.